Dutch yard Van der Valk has announced that the hull and superstructure have been joined on its third compact explorer yacht, which is due to be launched in 2020 for a repeat client. 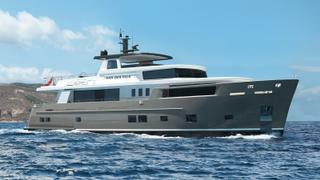 This 28.5 metre all-aluminium design, which was developed in collaboration with Guido de Groot Design, Diana Yacht Design and Ginton Naval Architects, follows on from the 25 metre Dutch Falcon and the 37 metre Santa Maria T.
Key features include a superyacht sundeck that is entirely dedicated to leisure, with no flybridge helm station to get in the way of al fresco entertainment. Instead, guests will be able to relax around a large dining table to port or on the compact L-shaped settee while enjoying a drink from the adjacent bar area. Elsewhere, the main deck aft will be fitted with a removable hardtop awning and a whirlpool tub flanked by sunpads. This area can be easily converted to store a Jet Ski and many more water toys, which will be launched via a davit crane with a maximum lifting capacity of 800kg. Accommodation is for up to ten guests split between five staterooms, including a main deck owner’s suite, two VIP doubles and two twin cabins, while the aft crew quarters is suitable for a staff of up to four people. Power will come from a pair of 1,650hp MAN V12 diesel engines for a top speed of 20 knots and comfortable cruising at 17 knots. The total fuel capacity of 22,000 litres should ensure a globetrotting cruising range.